The Vietnam Program for Internet & Society (VPIS), the University of Social Sciences and Humanities (VNU) – Vietnam National University is a pioneering academic institute in researching and severing as a think tank in the field of Internet & Society in Vietnam. We are looking for an outstanding candidate to join our team as Office Manager. The position is designed to work with local and International researchers having interdisciplinary background. 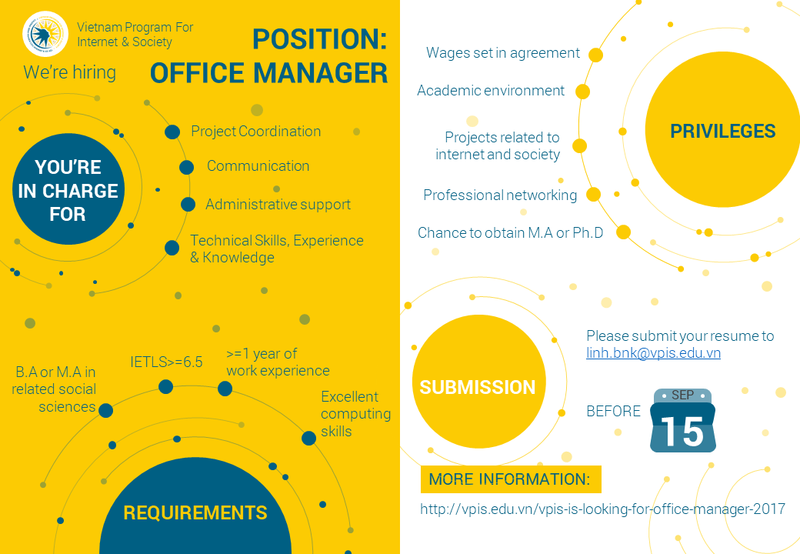 Successful candidate has the opportunity to coordinate national-scale projects, liaise with both domestic and international partners (academic institutes and other stakeholders) to operate pioneering researches and conference platforms to address the most needed of Vietnamese society. This position is highly suitable for candidates who plan to pursue MA, Phd or PostDoc in the future. We prefer candidates with at least 1 year of work experience on education/ administrative or similar fields however this is not the most important criteria. Qualified candidate for this post should (a)possess a desire to challenge himself or herself in new fields of researching related to social sciences & humanities and social media, digital government, gig economy, AI, Internet & health and others; (b) wish to expand the networks with both academic researchers and institutes in Vietnam and across the world, coordinate with multinational corporates. Manage database on external stakeholders and maintain external contacts. Coordinate in scheduling, managing external and internal meetings. Support in programme management and external relations. Coordinate with other teams across the organisation to ensure smooth operations and synergy. Provide other support in reporting, publications, proposal development, and research report. B.A or M.A in Media, Communications, Sociology, Business, International Studies or related social sciences. Excellent written and verbal English (IETLS>=6.5) and interpersonal skills. · Participate in research projects and international conferences related to internet and society. · Chance to obtain M.A or Ph.D if you intend to study abroad. - Deadline: 15/09/2017, early submission with appropriate qualifications will be given interviews priority.